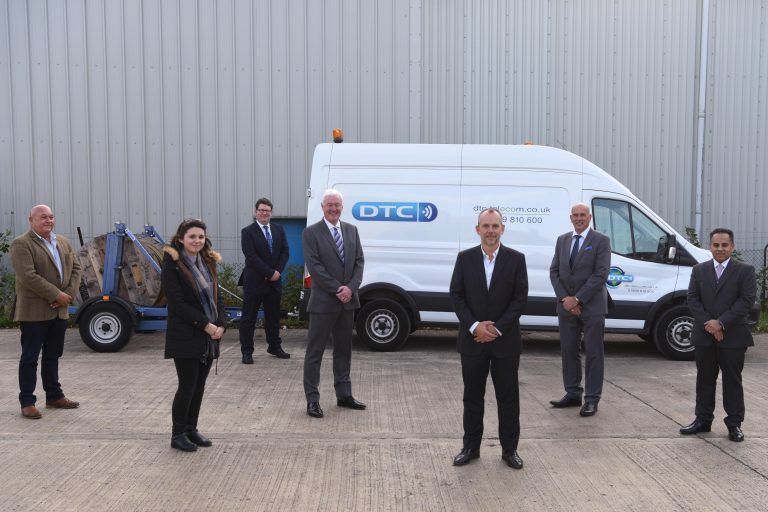 DTC Telecom is supported by Maven Capital Partners, the Midlands Engine Investment Fund and the British Bank to develop its Infrastructure Services business unit through the opening of a state–of–the–art engineering training centre in 2019. Our Infrastructure Services division resides within our TNS line of business and is fully engaged in the development of the UK broadband sector. This specific sector is currently under-going rapid growth and major investment. The UK Government recently announced, in its Future Telecom and Infrastructure Review, a £1.1 billion investment to give the majority of the population access to 5G, connect 15 million premises to full fibre broadband by 2025 and provide full fibre broadband coverage across all of the UK by 2033. Major telecoms operators, including BT and Virgin Media, are planning to spend £6B and £4B respectively over the next five to seven years in broadband roll-outs and network improvements. The new training centre is intended to be a centre of excellence in the industry, and is a crucial part of the company’s move to a direct-employment model, enabling the business to train employees to an exceptionally high standard, assist in ensuring higher workforce retention and offer cross-skilled engineers in a fast developing market sector in addition to utilization across our wider portfolio of services. DTC Telecom’s three lines of business (Reverse Logistics, After Market and Technical Network Services) comprise nine key services that deliver a value proposition built around Telecom Lifecycle Management to the global telecom industry during a time of rapid change and migration to next generation networking technologies. Our portfolio of services help clients maximise investment recovery from their surplus assets, reduce operating expenses and energy consumption through network consolidation, control Capex on installed legacy platforms, ensure corporate brand protection upon disposal, support wider environmental CSR policies and deliver safe compliant technical network services. For nearly three decades we have been delivering these benefits to telecom Operators, OEM’s, Multi- National Companies, System Integrators and Government departments. The increased focus on improving UK broadband networks, combined with the ever-evolving telecommunications landscape provides DTC Telecom with a major growth opportunity. The support and investment to develop an engineering training centre is perfect timing and affords DTC Telecom an advantageous position to fully exploit opportunities through this investment whilst helping to build the UK’s digital economy.